Alex said she tried several things to get the light to go off – but it didn't work. Her goal was to get the light to turn off. I would suggest that the goal should be to find out what caused the light to come on in the first place – and fix it. 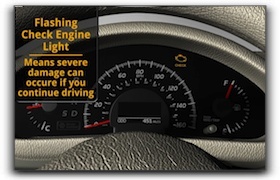 You can search the Internet and find millions of sites with tricks to get your vehicle check engine light to turn off. But what good does that do? Whatever caused the light to come still is not working. Not getting to the bottom of the problem can lead to other problems for drivers in Lenexa – some minor and some more serious. Your friendly and knowledgeable pros at BP Service can get you started down the road of properly diagnosing the problem and getting it repaired – try them first next time.